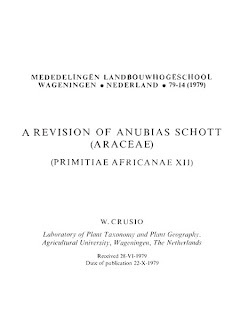 In 1979 in Wageningen (Netherlands) the young Wim Crusio under the direction of the professor De Wit defended his first research work. So the world received a revision of genus Anubias which still works. Already at that time these riverside West African plants were very popular among aquarians and year by year this interest has only increased. Nowadays some fanciers keep Anubias in a emersed condition; they learn their physiology and propagation by seeds and so on. A large quantity of the new anubias sorts and trade names have appeared at the market and very often we meet such questions as, Is the revision still acute? Doesn’t it go out of date? These questions we will ask to ourselves at the end of this note and now we try to define what new Crusio had put on the systematization of anubias. The texture of inflorescence was chosen as the main feature of this species. According to this feature the quantity of species was reduced to 8. A lot of herbaria, living plants, and descriptions of previous taxonomists (A. Engler and N. E. Brown) were used in making this revision. Some plants were acknowledged to be the synonyms of the existent species and others had a status of varieties inside the species Anubias barteri. Such names as Anubias auriculata, A. haullivelleana, A. affinis and others became a thing of the past. To what extent can this uniting approach be correct? It’s difficult to say, perhaps, it can be right if we analyze the definition of the word “species”, which are very vague. But for collectors and fanciers it’s very inconvenient, because many plants have similar inflorescences, but different leaf forms. As the result in many greenhouses two different A. hastifolia , several varieties of A. heterophylla are grown up. But we shouldn’t attach different species and trade names to these lists. It is absolutely incorrect, because such plants as A. barteri ‘Broad Leaf” and A. barteri var. nana ‘Petite’ don’t apply to the revision of the natural anubias’ species and they shouldn’t be systematized according to this revision. Now let’s return to the question – does the revision of 1979 go out of age? No! From the position of classical botany it can’t be out of age, because there isn’t any description of the new anubias’ species since then. Initially it can be incorrect or isn’t finished at all but it can’t be obsolete. It’s necessary to find the other morphological characters and approaches. At the beginning of the 1990-s the Moscow botanist Mikhail Serebryany had his own view on this question, but it hasn’t been published in scientifical literature. That’s why a new species A. erubescens, which he has suggested, is still a synonym of A. afzelii. Though M. Serebryany still wants to finish his work. I think that the future is behind the taxonomy, which is established on the genetic traits. The wide use of such approach is restricted by the high cost of such researches. Meantime the whole world used, uses and some of the time will use Wim Crusio’s “ageless” revision. The author of this note: Dmitry Loginov, moderator of the Russian Anubias-Forum. Photo: the cover of the revision. Crusio W. A revision of Anubias Schott (Araceae) // Meded. Landbouwhogeschool Wageningen. – 1979.